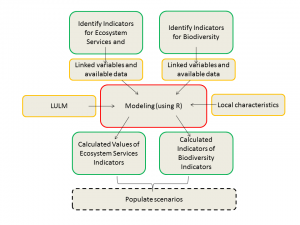 Work Package 2 resulted in the identification of relevant indicators for Ecosystem Services and Biodiversity (ESBD) states related to Agricultural Landscapes. ESBD indicators where selected from a literature review, linked to related variables, and then calculated by applying models. Indeed, several models were developed by the TALE WP2 team to quantify changes in ESBD indicators resulting from land use change. Inputs are spatially explicit variables related to local characteristics, as well as Land Use and Land Management (LULM). Modeling ESBD provides values useful to populate different scenarios, and observe environmental consequences following changes in legislation. ESS indicators selected in the frame of the CICES classification, and associated variables for each case study. 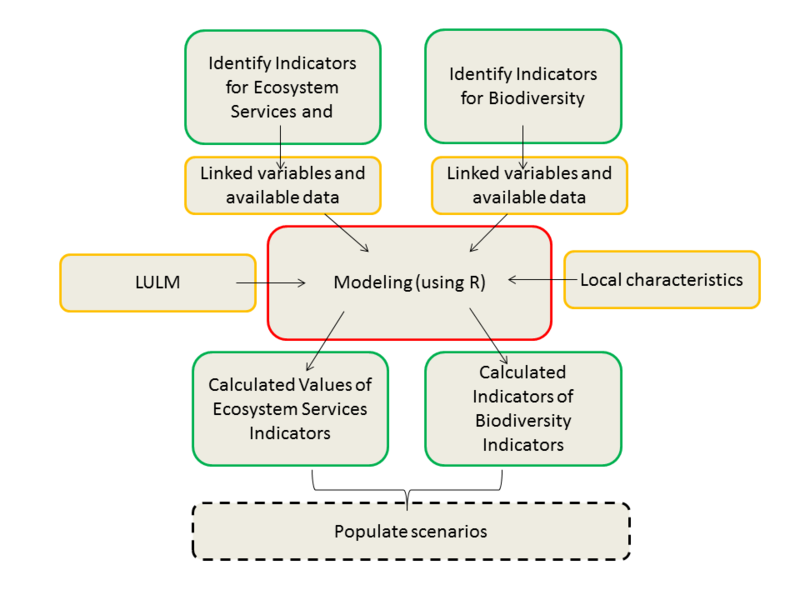 Biodiversity Indicators used for the TALE as recommended by Herzog et al. In the frame of the TALE project, the Helmholtz Centre for Environmental Research – UFZ, developed a species distribution model to account for the impacts on endangered bird species of the different land management scenarios. An overview of the model is available here. To understand further the model, run it through R by following the complete description step by step, and find the materials including data and scripts in this .zip folder. Impacts of land use change on biodiversity richness were observed in the frame of 3 different scenarios, modeled in the “443-Arroyo de La Balisa” subbasin (Spain). Indicators were calculated based on SWAT model for agricultural components and Phyton scripts for Biodiversity. Maps of the results shows the repartition of biodiversity richness in the case study area, in the baseline land use conditions, and the simulated land use conditions for each of the three scenarios.